I have a confession to make: I actually enjoy going grocery shopping. That can't be said for many people, who find the weekly chore tedious, and despite the necessity to stock up on kitchen staples, begrudgingly make the trip to the grocery store and back in as little time as possible. However, I love going to the grocery store, my list in hand, and if I have a bit more time that day to spare, to spend a few extra minutes browsing the aisles to see what new products they have in stock, or come across a special sale. Therefore, I was excited when my mom came across a Korean supermarket and suggested we visit it during our trip to Toronto last week. I was absolutely in for it. 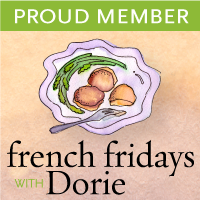 I think a great way to learn about different cultures is through their cuisine, so my mom and I have always been fascinated by supermarkets and grocers of all kinds: Italian, Middle Eastern, Japanese, Korean...the list goes on. Every time I go to a new cultural supermarket, I feel like a kid again on a field trip: there's always something new to see and learn. The Galleria Supermarket is similar to the Chinese supermarket we frequent when in the GTA area, T&T, with the obvious fact that everything here is Korean. The supermarket boasts a food court which serves traditional Korean, Korean-Chinese, and Japanese dishes. It also has a wide variety of already prepared hot meals and snacks, and makes tofu on-site. The meat and seafood selection also boasts a large variety and is extremely fresh, while you can head over to the banchan station to try almost two dozen different sidedishes. Naturally, we ended up picking up a bunch of things up while at the Galleria as I started to plan for a Korean barbecue dinner for later in the week when we returned home. I ended up making two classic Korean barbecue dishes: Galbi (갈비), grilled beef short ribs, and Samgyeopsal (삼겹살), grilled pork belly (pictured above). I was lucky enough to have the chance to experience a true Korean barbecue meal two years ago during my trip to Seoul, and it was unlike any Korean barbecue meal you'll ever experience in a North American restaurant. Firstly, North American Korean grill houses are always, always heavy on meat, a reflection on the more carnivorous diet of North Americans. Meat is quite expensive in Korea, and is consumed in small portions. What I found the most interesting too is that they'll often wrap a piece of grilled meat in a lettuce leaf with some rice, garlic, ssamjang, alson with some grilled kimchi or other grilled vegetables. Not only does this help cut through the greasiness of the meat, but you also end up eating a lot less meat overall, and you get a balance of both your proteins and your greens. I've come to love the way Koreans eat their grilled meat, and always wrap my meat in lettuce whenever I get the chance. 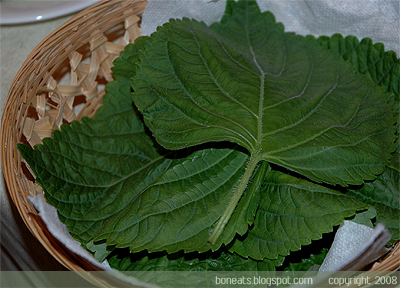 With the discovery of the Korean supermarket, I was finally able to get my hands on some perilla leaves (pictured above) to try out, which is also a very common leaf used to wrap meat with. Perilla leaves has a really distinct flavour, reminiscent to basil and mint and thus, adds a really interesting flavour to the grilled meat. 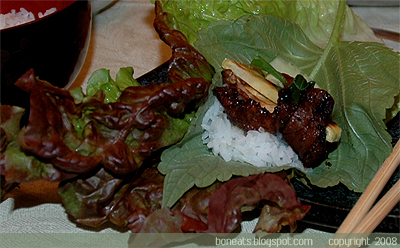 I love wrapping a piece of meat with some white rice, grilled sweet potato (the purple skinned, yellow flesh variety), grilled mushrooms (we grilled King Oyster mushrooms this time), some grilled green onions and sliced garlic cloves, a dab of homemade ssamjang and a slice of cucumber, a refreshing touch, in a piece of lettuce and perilla leaf (pictured below). Koreans often eat these lettuce wraps in one bite, so good luck trying to stuff the package into your mouth! 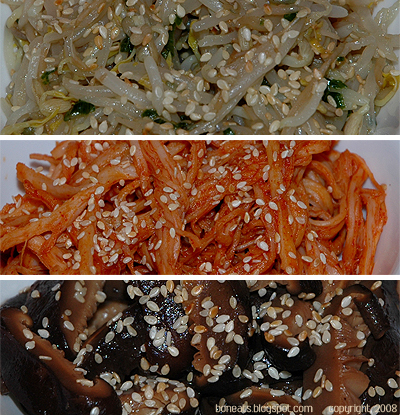 Besides buying some banchan (sidedishes) at the supermarket, including Ggakdugi (radish kimchi), Miyeok Joolgi (seasoned seaweed), Myolchi Bokeum (seasoned dried anchovies) and the staple on every Korean table, Kimchi, I also made some Pyogo Bohsot (stir-fried shiitake mushrooms), Sukju Namul Muchim (seasoned mung bean sprouts), and Ojingeochae Bokkeum (stir-fried dried squid strips) to accompany the grilled meat, rice and lettuce wraps. 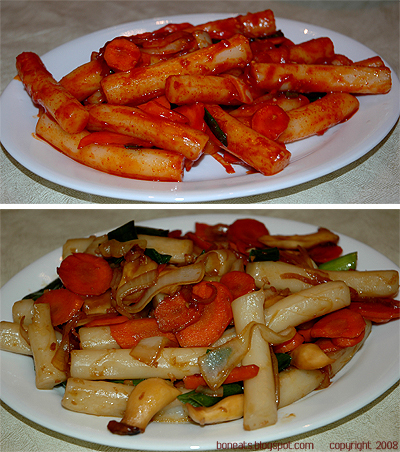 I also picked up some fresh rice cakes at the supermarket and stir-fried them a few nights ago in two different ways: one in a sweet & spicy sauce, and the other in a savoury sauce. The sweet & spicy sauce, known as Ddeokbokki (떡볶이) is the more commonly eaten dish in Korea, and can be found all over the streets of Seoul at street vendors. While in Seoul, I often saw groups of people standing around these carts and vendors, a toothpick or wooden chopsticks in hand with a bowl of this bright red concoction, poking away at these soft and chewy rice cakes. The other version I made is made with soy sauce, and is also quite delicious. That version is known as Gungjung Ddeokbokki, which translates into something like "Royal Rice Cake"
It's definitely been a culinary adventure these past few days, as I've been absorbed in learning more about Korean cuisine, and enjoy their food. It's a fun (and delicious!) way to learn about a different culture, and I strongly urge you to do the same when you some free time on your hands. Check out a cultural grocer and supermarket, and have fun with the new and unfamiliar ingredients you'll come home with next time! Rinse meat under cold water. Dry wet paper towel and set aside. In a food processor, add the chopped onion and pear and puree finely. Pour mixture out into a large, nonreactive bowl and add the remaining ingredients; stir. Add the ribs into the bowl, and mix to combine. Cover with plastic wrap and marinate the ribs for 8-10 hours or overnight in the refrigerator. Alternatively, place the ribs into a large ziplock bag and pour the marinade over the ribs. Seal the bag, massage the ribs a little and place the bag into the fridge. 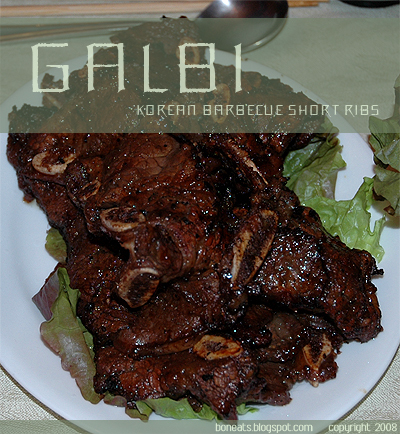 Traditionally, galbi is grilled with wood charcoal, but you can certainly grill it on a gas stove, indoor electric grill or an outdoor grill. They cook fairly fast, about 2-3 minutes on one side. 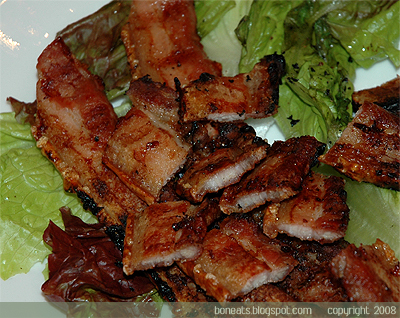 Serve with lettuce, perilla leaves (if available), spring onions, sliced garlic cloves, cucumbers sliced lengthwise, ssamjang, and white rice, if desired. **N.A. If you can't find either Asian pear or Korean pear, you can substitute 1/2 a kiwi for the pear. The pear juice actually acts as a meat tenderizer, but the kiwi fruit does the same trick. Using pear juice or kiwi juice will ensure that you'll have beautifully tender short ribs after being grilled, rather than trying to chew on stringy and tough beef. Posted by Bonita at 5:40 p.m.
Edith June 21, 2008 at 12:50 p.m. I love grocery shopping too!